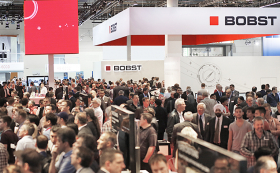 At drupa 2016 the all-new BOBST MASTERCUT 106 PER die-cutter makes its world premiere. This brand new, completely redesigned press features a wide range of new and improved systems that allow it to set new standards in die-cutting productivity and ease of operation. 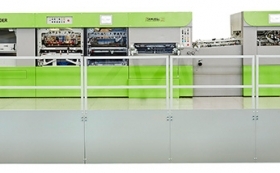 The new MASTERCUT 106 PER confirms that BOBST, the inventors of automated die-cutting of folding cartons, continue to be the leading innovators in the design and manufacture of this equipment, delivering technology that helps clients reduce costs, improve productivity and open up new markets. Philippe Milliet, Head of BOBST’s Business Unit Sheet-fed, says “The MASTERCUT 106 PER builds on the success of our market-leading EXPERTCUT 106 models, which have become the benchmark in the carton industry for die-cutting performance. The re-imagining of the MASTERCUT, with its new range of systems, means it can now run at an incredible 11’000 sheets an hour. That’s 20% faster than the EXPERTCUT. And, like the EXPERTCUT, the new MASTERCUT is able to keep this performance up all day, every day." The systems that allow this uninterrupted high speed running, and which considerably reduce make-ready times, include the new, enhanced SMART FEEDER 3 and POWER REGISTER 3, which together ensure high uptime and high speed running. The new MASTERCUT also features new "MATIC" machine setting for the highest degree of automatic operation available on any die-cutter, and a completely new HMI (Human Machine Interface) which, allied with even further improved ergonomics, mean easier set-up and running, and further increases in productivity. SMART FEEDER 3 is the latest generation of the BOBST automated, intelligent sheet feeding system and works in tandem with the machine’s POWER REGISTER system to reduce in-production stoppages and maximize productivity. With this new version of SMART FEEDER, photocells at the feeder inlet detect the actual size of the sheets on the pile as it enters allowing it to initiate a number of automatic settings without the need for operator intervention During production, SMART FEEDER 3 constantly adapts the position of the pile in the feeder, keeping the sheets in the optimum position for registration without the operator having to intervene. If there should be a feed related stop, SMART FEEDER 3 automatically disengages the feeder from the rest of the machine, allowing already fed sheets to complete die-cutting. In such a case, the feed table upper transport equipment lifts automatically, allowing the operator to intervene quickly, after which the simple touch of a button re-engages SMART FEEDER 3 and feeding continues as if nothing had happened, so reducing lost time and maximizing productivity. 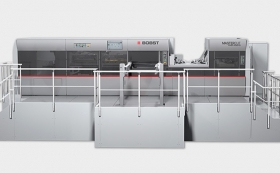 The next innovation on the new MASTERCUT 106 PER is the third generation of POWER REGISTER, BOBST’s acclaimed "no-contact" sheet-registration system, which was introduced at drupa 2000 and brought high accuracy, high performance, automated cut-to-print registration to the industry. This latest version has a 65% larger correction range at the front edge of the sheet, virtually eliminating all feed-related stops. POWER REGISTER 3 also allows print reading from underneath, which is essential when die-cutting litho-laminated sheets. The system has a new auto-teach in function which automatically calibrates its cameras according to the print on the sheet, eliminating possible human errors, and allowing for faster set-up while making job changeover easier for the operator. Together SMART FEEDER 3 and POWER REGISTER 3 mean that the operator does not have to constantly check sheet arrival and does not need to manually adjust the pile position in the feeder or change its timing. These two clever systems handle this very precisely and without the need for intervention. The MATIC systems on the new MASTERCUT 106 PER mean that the die-cutter configures itself fully automatically from feeder to delivery, with no operator intervention needed. This gains users at least ten minutes per job set-up, or up to 1,800 extra sheets. Such a saving represents substantial extra availability that can be used for additional production. MASTERCUT’s MATIC settings are also extremely precise and it automatically configures, among other items: the feeder section, suction head, side blowers and guides, transport equipment on the feed-table, POWER REGISTER 3 lateral camera, Bernoulli sheet breaking tablets, and electronic functions for the stripping and blanking tools settings. A new “End job – New job” function automatically stops the machine, unlocks all the tooling and then sets itself for the next job when the new tooling has been put into place. Maintaining quality at 11,000 sheets per hour requires very precise control of gripper bar motion. To achieve this, BOBST has an exclusive double cam gripper bar advance system which, even at full running speed, ensures the gentle acceleration and deceleration of the sheets as they come to a halt in the die-cutting, stripping and blanking stations. This system allows for the use of small nicks, which in turn mean excellent finished box quality despite the very high machine output. The first and last sheets of a pile brought to the die-cutter from print can sometimes be damaged due to direct contact with the pallet or from handling by a pile turner. The first and last sheet evacuation system on the new MASTERCUT detects these sheets, locks stripping and blanking tools in their upper position to prevent them processing the sheets and passes them directly to the waste evacuation conveyor. This ensures that these potentially damaged sheets do not make their way into the final product stream and guarantees 100% quality at the delivery, without the need for operator intervention. Making a machine easier and more logical to operate always contributes to increased productivity and with this in mind the ergonomics of the new MASTERCUT have been looked at in depth by BOBST’s engineers. This machine has an entirely new, and highly intuitive, Human Machine Interface (HMI), the central control unit of the machine. Larger than its predecessor, all the settings for the machine are accessed from a single page on its 22" full color, HD touchscreen. This new HMI easily guides the operator through the complete setting of the machine step by step, and can now store up to five thousand jobs, making repeat runs ready to go very quickly and speeding up any changes needed during production. The entire machine can be set and operated from the main podium, including settings for the opposite operator side or inside of the machine, saving considerable time. The new "End job – New job" functions save time on every job changeover while, during the run, several cameras allow the operator to monitor all activity on the opposite-side, front and rear of the machine. The MASTERCUT 106 PER has an integrated, patented tool alignment feature, guaranteeing perfect alignment between the registered sheet and the stripping and blanking tools. Being video guided through the HMI, the operator remains on the podium without the need to go to the opposite side or inside of the machine, speeding up setting and making for fast production start up. If the machine does stop, LED lighting indicates to the operator which section to go to, allowing them to get the machine back in production in minimum time. Security light-barriers at all open parts of the machine protect the operator, and the machine will automatically stop if crossed. With fewer sheets used at start-up, more consistent die-cutting quality, and a reduced need for overproduction from upstream, the new MASTERCUT means less waste. BOBST machines also have the longest service life in the industry, saving valuable natural resources. 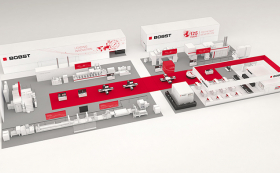 Along with access to the worldwide network of BOBST services centers, which supply telephone and on-site technical support, spare parts and upgrades, packaging makers who invest in a new MASTERCUT 106 PER also have a machine which is ready equipped for BOBST HELPLINE PLUS and CONNECT services. These enable remote troubleshooting, access to production monitoring apps, and the ability to be integrated into plant management software. The new MASTERCUT 106 PER on show at drupa 2016 is fitted with the optional AUTOMATIC PILE TRANSFER system which carries out the fully automatic transfer of piles and pallets from feeder to delivery, reducing operator intervention and increasing productivity. Versions go from simple pile transfer into the feeder to the comprehensive version covering pile and pallet transfers through the whole machine with empty pallet collection and stacking. Also available to keep the productivity of the users’ new die-cutter maximized is the BOBST Maintenance Premium program, which covers all spare parts, on-site interventions and includes remote assistance. Maintenance Premium is the most cost-effective way of keeping BOBST equipment at maximum performance and efficiency over many years of service.